A lucky man from Saskatchewan has just recently hit the million-dollar slot machine jackpot at the Dakota Dunes Casino, part of the White Cap Dakota First Nation. 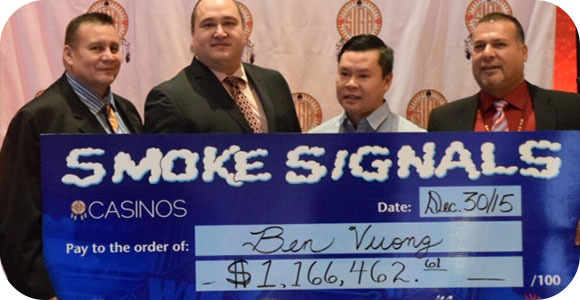 Ben Vuong, a regular player at the casino, who truly enjoy playing at the machines is the lucky winner of a total of $1,166,462. The prize was part of the smoke signals jackpot and was won earlier this week. This was part of the progressive jackpot that links 52 slot machines in six Saskatchewan casinos, where it grows daily as more people play. Due to this, the minimum someone could win from the largest jackpot would be $1 million, and it pays out before it hits $2 million. As we speak, it is back to $1 million and there is a good chance that it will pay out again soon. This is a great start to the New Year, especially for Ben Vuong. This isn’t the only good news concerning slots, as the Wynn Resorts Casino in Las Vegas seems to have the equation to continue making a profit and trying to increase their growth. This could probably help other casinos, not only in Las Vegas, who have been hit hard by the decline in slot machine players going on several years now. One aspect from their equation to being more successful is actually paying out more often, which is why this fits perfectly with why the Dakota Dunes Casino is still profiting despite just paying out $1.1 million.